Bana Uganda batandise okwekyusa mungeri gyebalabamu abafuzi babwe. Live bullets and teargas rocked Rukungiri Municipality on Monday as Anti-riot police clashed with Forum for Democratic Change (FDC) party supporters. It all started when police blocked the FDC supporters from accessing Rukungiri Municipal stadium for thanksgiving prayers and commemoration of the late Edison Nasasira alias Kakuru, a taxi tout at Nabugabo stage and a resident of Kafunjo cell in Eastern division in Rukungiri. He was shot dead by Anti-riot police on October 18, 2017 during clashes between police and opposition supporters when police denied them access to Rukungiri Municipal stadium. Six others including Junior Aijuka, Farouk Bangirana, Julius Turyomunsi, Christopher Muhwezi, Davidson Aryasingura and Naris Muhumuza sustained gunshot wounds in the fracas. On Sunday, Rukungiri district police commander Moses Nanoka and the Kigezi region police spokesperson, Ely Maate said they wouldn't allow the opposition gathering to take place, saying the organisers hadn't sought police clearance. On Monday morning, security officials led by the Kigezi region police commander, Richard Ecega, Rukungiri district police commander, Moses Nanoka and Rukungiri resident district commissioner, Dan Kaguta held a closed door meeting with FDC leaders including the former president, Dr Kiiza Besigye, FDC party President, Patrick Oboi Amuriat, the Rujumbura County member of parliament, Fred Turyamuhweza and Woman member of parliament, Betty Bamukwawsa Muzaniira. However, the parties failed to agree on a way forward. After the meeting, Besigye retreated to his home in Rwakabengo village in Southern Division to prepare for the function. He heavily armed Anti-riot police cordoned off the home and blocked him from leaving. At around 2:30pm, a group of angry FDC supporters led by their national mobilization secretary, Ingrid Turinawe gathered in front of their party offices and started praying. Others lit fire in the middle of the roads expressing to protest police presence in the area prompting police to disperse them using tear gas and water cannons. During the fracas, police picked up Turinawe, the deputy speaker Rukungiri Municipality, Innocent Tashobya and Nicholas Atuhairwe, an FDC youth activist among other party members. Kaguta said as security, they cannot allow an unauthorized gathering to take place since it contravenes the Public Order management Act. What sort of a modern democratic African country is this? Interesting that these riot lorries were bought from the former troublesome Apartheid police force system of South Africa and they were built by Israel. Gruesome pictures of security goons abducting Mr Yusuf Kawooya near Christ the King church in Kampala on 17th October 2018 shocked the country. Unfortunately, that is not an isolated incident. Such scenes are much more frequent than is reported. Dr Ismail Kalule, whose only crime was to stand surety for a terrorism suspect was arrested and spent 8 years on remand. He was re-arrested inside the court premises by similar security goons on securing bail after to the State's failure to adduce evidence. The same situation happened to a one Senfuka at Nakawa traffic junction, while Abdul Kateregga was shot and bled to death while security operatives took pictures of his body. Gen Museveni and his NRM outfit have been touting the "peace" they brought to Uganda since 1986 as their major achievement. Wikipedia explains peace as "a lack of conflict (such as war) and FREEDOM from FEAR of VIOLENCE between individuals. Former US President Ronald Reagan is quoted to have said, "Peace is not the absence of conflict, it is the ability to handle conflict by peaceful means." After violently capturing power in 1986, Mr Museveni and his occupational army assured Ugandans that they had brought peace and sleep. They promised, in their Ten-Point Program, to uphold human rights including freedom and the right to life and property. In his 1996 election manifesto, Mr Museveni promised to consolidate peace. He followed up in his 2001 manifesto with the same promise, listing six achievements amongst which was "overthrowing dictatorships" and asked for one more term, to enable him "build pro-people institutions, professionalise the army and put in place a mechanism for an orderly succession." What is the reality on the ground? First, he did not retire. Instead, he removed all mechanisms for an orderly succession when he engineered the removal of the term limits and recently the age limit which was the last constitutional safeguard that would have ensured a peaceful transition of power in 2021. 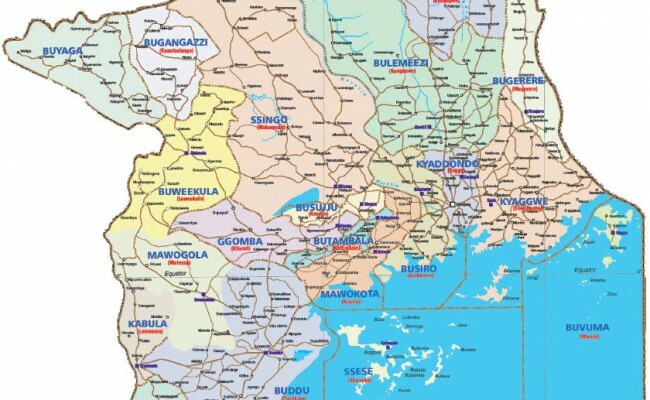 For over 20 years, northern Uganda was in insurgency. Part of the reasons for the prolonged war was Mr Museveni's military adamancy; he insisted on a military solution as opposed to a peace process. In 1994, then minister Betty Bigombe engaged the rebels in peace talks but in the middle of confidence-building measures, Mr Museveni issued an ultimatum to the rebels to either abandon the bush or be flushed out by the army. The peace efforts collapsed and the war went on! The cost of war in terms of human life, property and financial implications was colossal. While the north was being ravaged by the war, the south was grappling with bomb blasts that rocked the country in the 1990s with loss of life allegedly orchestrated by the ADF rebels. Then came the 2001 elections and the "Movement" political system revealed it's true face when Dr Kizza Besigye decided to run for presidency. Violence, intimidation, voter bribery and vote rigging at levels never before witnessed in Uganda's history marked the election period. Besigye's first rally in Rukungiri was attacked by soldiers commanded by (then) Capt Patrick Kankiriho, leading to death and grave injuries of innocent people. Then there was Major Kakooza Mutale's Kalangala Action Plan, which also rained terror on citizens. So much was the violence that the Electoral Commission chairman, Hajji Aziz Kasujja wrote a letter to Mr Museveni appealing to him to reign in his army from interfering in the electoral process. The letter was tabled as evidence in the electoral petition of 2001 in the Supreme court. Gen Kale Kayihura, was appointed police boss in 2005. He understood his job-description to be 'to protect the Museveni from political opposition at all costs' and steadily remodelled the police from a civilian force to a regime militia. Everything else took a backseat. As a result, criminality soared as police was incompetent to prevent or in the least, conclusively investigate incidents. By 2016, police was sitting on over 4,000 unresolved murders. The situation became so embarrassing that they stopped compiling annual reports. The only area police remained sharp was the capacity and efficiency to clamp down on opposition activities. I once challenged a district police commander (DPC) in Njeru to show me a part of the Public Order Management Act he was relying on to disperse our Forum for Democratic (FDC) party meeting inside a restaurant. The man failed to cite the law but still dispersed the meeting! Activist Frank Gashumba summarised the malaise in the police when he posted a video of himself calling police for help over fictitious "stolen car". The phone calls failed to go through to the police emergency line on the first attempts, and when he eventually got through, the officers failed to answer it. When they finally answered, they simply directed him to "go to the nearest police station" without giving directions and then hang up. Every opposition politician worth his name is either in jail, out on bail or out on police bond. Working in cahoots with the police is the office of the Directorate of Public Prosecutions who sanction any charge however silly as long as the suspect is a regime opponent. Dr Kizza Besigye probably holds the record for arrests and prosecution of an individual in Uganda. It doesn't bother them that the charges are never sustainable, it is the inconvenience, financial drain and psychological torture that they are after. Dr Besigye took then CID chief Elizabeth Kuteesa for fabricating evidence against him in 2005, then again in 2008 when the Uganda Law Society charged the commanders of the infamous raid on the High court by the Black Mamba and most recently when private lawyers charged Gen Kayihura under the Anti-Torture Act in 2016. The perpetrators of this abuse of office are rewarded with judicial appointments, one to the Supreme court and another to the High court and now Electoral Commission. How then do you expect a Supreme court judge with such a checkered past to rule in a case that potentially ends Mr Museveni's regime. But if you thought police was bad, let me introduce you to the Special Forces Command, Gen Museveni's personal guard, whose loyalty to his person can only be matched by the SS Leibstandarte of the German dictator Adolf Hitler. They are fiercely loyal to the point of fanaticism, ruthless, brutal, efficient, armed to the teeth, highly trained in all matters of war apart from professionalism, humaneness and patriotism. To them, Uganda is Museveni and Museveni is Uganda. This outfit which is an army on it's own with questionable legality was heavily involved in beating MPs in parliament and in election violence in Jinja East, Rukingiri, Bugiri and Arua, where they beat and crippled regime opponents. These days, the SFC has taken over police duties in dispersing demonstrations using crude brutal methods and violence with reckless abandon. The SFC is the modern day Praetorian Guard, and just like the ancient Roman specialised unit, it will one day seek to decide and determine who runs this country. Therefore, we can not say we have peace when the State is absent when we need it to provide emergency services such as ambulances, drugs in hospitals, quality healthcare and quality education for all and yet always present in an overbearing manner to curtail civil rights and liberties in form of teargas and live bullets in every corner of the country. You can not have peace as young Muslim men, when whenever a high profile murder occurs, the State is sending goons to arrest some of you, arrest those who attempt to stand surety for you and arrest journalists who pass on notes between you and your lawyers. Those travelling to Uganda for the first time are stunned by the levels of deployed military grade hardware along the road from the airport to the city and all roundabouts surrounding the city. The regime is operating in a siege mentality. Mr Museveni's "peace" is in piece meal. At no time has Uganda been peaceful in all regions, as Mr Museveni frequently claims. Perhaps, peace is too much to ask of someone whose university dissertation was on the use of violence as a means to a political end, and has previously bragged about his NRM party being the masters of violence. Hon Betty Kamya, current minister in charge of Kampala city, while still in opposition, wrote an article in the Daily Monitor of 28th January 2008 titled "Where is Museveni's heart?" where she notes that Museveni "came holding peace and sleep while Ugandans held factories, banks, aircraft, railways cooperative unions, food silos, fuel reserves, schools, Kampala city (how ironic) and land. He convinced us to catch up on some long eluded sleep while he sorted things out. We slept for 20 years and when we woke up, we were holding peace while he held our assets". It is of extreme irony that Hon Betty Kamya is now the one holding Kampala city hostage on behalf of Mr Museveni. In the FDC, we believe in and practice peace and peaceful methods in everything we do. We have conflicts, but resolve them peacefully, even if it means separation. The fact that we were able to peacefully resolve issues in charged election atmosphere is a small but telling example of our capacity to cultivate real peace. At least five people have been killed and scores are recovering from severe injuries, some with gunshot wounds. At least 33 people have been charged with treason and many are still held without charge, while about 150 people are on remand following the violence in last month’s by-election in Arua Municipality. The violence erupted in Arua Town on August 13, following allegations of the President’s convoy being pelted with stones by supporters of then Independent candidate Kassiano Wadri, who would as a result be arrested and win the election while in jail. It was the final day of campaigns for the by-election and President Museveni was in town to campaign for Ms Nusura Tiperu, his National Resistance Movement (NRM) party’s candidate. Dr Kizza Besigye had also travelled to campaign for the Forum for Democratic Change (FDC) party’s Bruce Musema and a group of politicians, including Kyadondo East MP Robert Kyagulanyi, aka Bobi Wine, were campaigning for Mr Wadri. President Museveni and the ruling party on the one hand, and the Opposition on the other, have given varying accounts of what exactly led to the violence that has dominated conversation in the country over three weeks later. In recounting the human cost of the violence, Saturday Monitor sums up the stories of those killed, injured, tortured and those arrested as a result of, among other things, the skirmishes that followed. Yasin Kawuma: The driver of Bobi Wine, was the first casualty of the violence shot in Arua just outside the hotel in which his boss was boarding. The circumstances of his shooting have not been clarified and the government now says it has launched an inquiry into the same, despite the various players and President Museveni coming out with definitive positions on what happened. It is difficult to say whether the investigations will make any progress. Samuel Ssekiziyivu. Five days later on Sunday August 19, Ssekiziyivu died on the spot in Mityana Town when policemen opened fire on a taxi that was ferrying football fans heading for Buganda Kingdom Masaza (County) Cup tournament in Mukono District. The policemen were attempting to quell civil strife as the residents of the town protested the manner in which the area MP, Mr Francis Zaake, had been tortured by soldiers in Arua. Mr Zaake spent more than two weeks in bad shape in Lubaga Hospital and after some incidents, was allowed to fly out to India to receive further treatment. Bobi Wine had also been tortured during a drama-filled arrest in Arua that left hotel doors broken and many others beaten to pulp. He also flew out to the US to seek further treatment. Lawrence Jjingo. He was the third casualty, who was also shot in the taxi in Mityana and eventually lost the battle to his wounds in hospital. Another five who were shot in the incident are recovering in hospital. Racheal Ayebazibwe. The fourth victim of the violence related to Arua, Ayebazibwe succumbed to bullet wounds at Victoria Hospital, Bukoto, Kampala. She was admitted to the facility after she was hit by a bullet when police and the military were quelling riots in Kyebando, a Kampala suburb on Sunday, August 19. The protesters were calling for the release of Bobi Wine, who had been incarcerated at Makindye Military Barracks where the army general court martial remanded him after charging him with illegal possession of fire arms. She had just completed studies for her degree at Kyambogo University. Vincent Sserungaya. The 38-year-old a boda-boda cyclist and a resident of Bukalagi, Gomba District, was the fifth known victim of the violence related to Arua. Gomba is the birthplace of Bobi Wine and upon his arrest, residents of Kanoni, the seat of the district, rose up in a demonstration. It was in the process of quelling it that Sserungaya was shot dead by a policeman. Apart from the tortured suspects arrested in Arua, there were several other people who sustained injuries both in the West Nile town and others in Kampala and Mityana towns. During the military raid on Mr Wadri’ supporters that have since been accused of smashing the rear screen of one of the presidential vehicle, five people were shot and injured during the fracas. Two of them - Michael Abiriga and Gilbert Eyotre were treated at Rhema Hospital, a private facility in Arua Twon, where they underwent surgery. Three others - Innocent Asega, Isaac Egama and Philliam Anguyo, were treated at Arua Regional Referral Hospital. At some stage, their lawyer, Mr George Williams Alenyo, wrote to President Museveni asking for financial support to fly the five victims to South Africa for further medication. However, this newspaper has learnt that these five victims were discharged from hospital last week and are recovering from home. “Abiriga was discharged from hospital and is now at home. He still has a lot of pain in the chest where he was shot and yesterday [Wednesday], he went back to hospital (Rhema) for review. He can now walk, eat and talk,” said Mr Robert Apango, his brother. From the Kampala chaos, teenager and student Aisha Nabulumba is undergoing treatment at the Mulago National Referral Hospital, after she was shot on August 20 on her way home from Al-Fahad Vocational Institute in Katwe, a city suburb. “People who attempted to carry me were beaten... one man was caning me as I lay on ground,” Ms Nabalumba told this newspaper last week. A bullet that lodged in her stomach after being shot in the buttocks has since been removed after a surgery. The four survivors of the Mityana shootings have since been discharged from hospital. One was treated in Mityana and discharged after one night, whereas three were at Mulago hospital. “They have all been discharged from hospital and are now in their homes,” said Mr Nobert Ochom, the Wamala regional police spokesperson. Apart from Mr Zaake, who was never arraigned in court and remanded, 33 suspects arrested in Arua were last week released on bail by the Gulu High Court. Mr Zaake was reportedly dumped at the gate of Lubaga Hospital in the wee hours of Friday August 17. Later, President Museveni, in a statement, said the legislator had escaped from lawful custody in Arua. Ms Night Asara, the FDC women league chairperson for Arua District is one other torture victim whose condition, when she first appeared before the Gulu Chief Magistrate court, worried Ugandans. Lawyers said she was bleeding from her private parts after being severely tortured in detention. Two other women, Jane Abola and Sauda Madada were also allegedly tortured and injured during arrest. Also badly injured was Shaban Atiku, who was reportedly the driver of Mr Wadri and Stephen Gamba, a resident of Arua were also reportedly tortured and injured. Mr Wadri on Thursday briefed this newspaper about the conditions of these five people following their release on bail. He said, apart from Ms Sauda Madada, who is still undergoing treatment at a facility in Kampala, which he did not want to reveal, the rest are back in their homes but on medication prescribed to them in hospital. “Asara (Night) is in immense pain but at home. Atiku (Shaban) is not my driver but a villagemate and he is now in Arua resting at home on advice of doctors from Arua hospital. I also talked to Abola (Jane) who is also taking medicine from home (Kiryandongo),” Mr Wadri said. He, however, said Ms Madada was still vomiting blood. He said, Ms Madada was hit by a cartridge of the bullet that killed Kawuma because they were sitting in the same vehicle, and she was then tortured in detention. “She was admitted in hospital here in Kampala and I was with her yesterday (Wednesday). 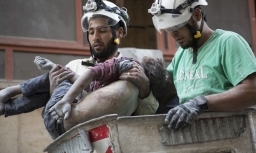 She still vomits blood and doctors are doing their best to ensure she gets out of this,” Mr Wadri said. The legislator, who is banned from stepping foot in Arua for three months as part of his bail conditions, said Ms Asara has since suffered hearing impairments as a result of torture. Following the repeated protests in downtown Kampala and Kamwokya suburb, police arrested 103 suspects in the metropolitan area. “We arrested 103 people from Kampala metropolitan area and they have all appeared in court, were charged and remanded to Luzira prison,” said Mr Luke Owoyesigyire, the Kampala Metropolitan police, spokesperson. He said they were charged with several offences, including unlawful assembly and malicious damage to property. 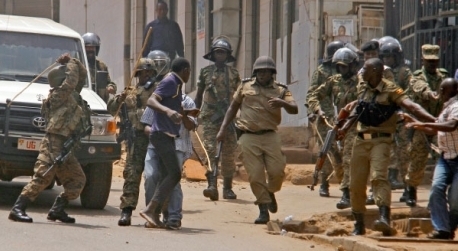 In Mityana, 23 people were arrested but 18 of them were taken to court following a screening exercise by police in which five were found not to be connected to the protests. Mr Norbert Ochom, the Wamala regional police spokesperson, said all the 18 have since been remanded on charges of inciting violence and malicious damage to property. Also arrested and held incommunicado for several days is Mr Bobi Wine’s bodyguard, Eddy Sebuufu, aka Eddie Mutwe. The High Court in Kampala was on Tuesday told that Mr Sebuufu was to be arraigned in the Gulu Magistrate Court to face treason charges in relation to stoning of the presidential motorcade. Mr Ssebuufu will be the 35th suspect to join the charge sheet, which already includes his boss Bobi Wine and four other MPs. High Court Judge Musa Sekaana was informed about the new development by State prosecutor Peter Tusubiira following a habeas corpus issued to the Chief of Defense Forces, Gen David Muhoozi, Chieftaincy of Military Intelligence and Attorney General to produce him on that day. 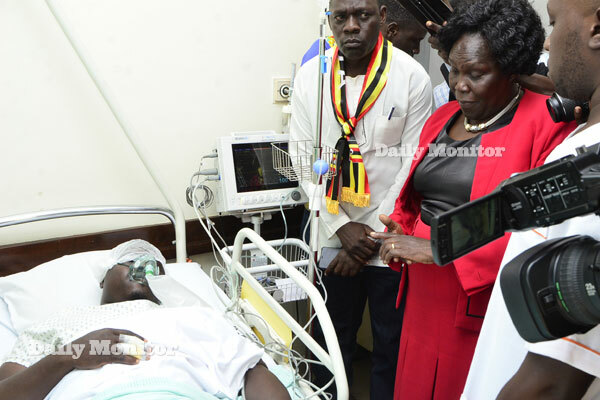 The Leader of Opposition in Parliament, Ms Betty Aol and Kampala Mayor Erias Lukwago have this afternoon visited Mityana Municipality Member of Parliament, Francis Zaake who is bedridden in a coma-like condition at Rubaga hospital. According to his lawyer Richard Lumu, the legislator whose detention centre was not known since his arrest in Arua on Monday, was “dumped” at Rubaga hospital at about 3am this morning. On arrival from Makindye military barracks where Kyadondo East MP Robert Kyagulanyi aka Bobi Wine is being detained under similar conditions, Ms Aol accompanied by Mayor Lukwago, Kilak County MP Gilbert Oulanya and Buhweju County MP Francis Mwijukye, they were first taken to the hospital administration block. After a wait of more than 15 minutes, one of the medics who did not identify herself, led the team jammed with dozens of journalists to the surgical ward where Zaake is being treated on life support. Inside the treatment room, Zaake was found in the care of a male doctor who did not entertain any questions hence not explaining in medical terms what condition the legislator was. Ms Aol who shed tears told journalists outside the surgical ward that, “Hon Zaake’s life is on the mercy of God and we pray that he keeps him alive”. She said that Zaake was subjected to “severe” beatings and torture which has put his life in more danger as he was still recovering from the injuries he sustained when he was beaten up in parliament during the anti-age limit removal protests last year. The Mp was treated in the United States of America. “His condition is very bad,” she said. Adding that; “the people who tortured him did it with an intention of killing Hon Zaake. We hope that he gets better”. She said the opposition MPs will soon sit and chat a way forward on what action to take in regard to the condition of the two MPs. Lord Mayor Lukwago described Zaake’s state as “vegetative” adding that he was tortured to near death. Lukwago said the situation of Mr Kyagulanyi in Makindye is not any better than that of Zaake. “Hon Kyagulanyi is also in a bad condition. He can only be lifted and they (military) are the ones lifting him and he cannot speak,” Mr Lukwago said. At around midday, Mr Lumu, the lawyer for Zaake had told us that he was being transferred to Nakasero hospital for specialised medical check up on what might have happened to the internal body system. He said that, the doctors however, called him that they delayed to transfer him because they were waiting for the visit of the Speaker of Parliament, Rebecca Kadaga. Daily Monitor later understood that Neither Ms Kadaga nor her deputy, Jacob Oulanyah was in Kampala. By press time, it was not yet clear whether the hospital administration which refused to speak to the journalist will transfer him as earlier planned. Mu Uganda, eby'omubaka wa Parliamenti Nambooze tebinnaggwa! Kubanga governmenti ya NRM etuuse okusiba buli muntu yenna alina ekirowoozo kyonna mu mutima gwe oba mubwongo bwe, newankubadde tayogedde, nti governmenti esanidde okuvaako. Allan Mumpe, Kuno okwesimira entana e Luweero, nebakukuba akakumbi kumutwe nogwa muntana gyewesimidde byoyagala bikomewo dear? 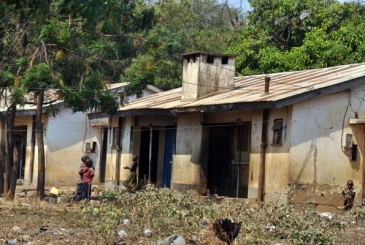 Ffe abatuuze abatambudeko tusaba governmenti eno etekewo ekifo abantu webagenda nebogera nemimwa gyabwe kyonna kyebagala. E Bulaya bakitekawo dda. Bwomala okwogera nga ogenda eka nga webaka awatali kuzza musango gwonna. City lawyer Richard Buzibira is on the spot for fraudulently receiving over Shs 1.47 billion of his client from the Land Fund. Buzibira reportedly used the letters of attorney from his client, Teddy Nansubuga, a farmer from Kibaale district to process and receive her compensation money from the Uganda Land Commission (ULC). Buzibira reportedly took advantage of Nansubuga's illiteracy to defraud over Shs 1.2 billion having paid her only Shs 270 million of the Shs 1.47 billion paid by the Land Fund. 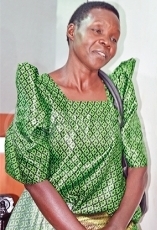 While appearing before the Justice Catherine Bamugemereire Commission on Friday last week, Nansubuga, explained that she and her late uncle, Raphael Kulumba approached Buzibira at his Kampala based office to help her to reclaim compensation from government for Block 223, Plot 1 Buyaga and Block 224, Plot 1 Buyaga - totalling to 254.2 hectares. "I surrendered my two land titles and we made an agreement that I had given him the titles to help me process compensation from government." Nansubuga told the Commission in Lunyoro. Nansubuga explained that she signed several documents drafted by Buzibira that were translated to her by Dennis Musinguzi, a surveyor from Kibaale district she found in the lawyer's office. The Commission's deputy lead counsel John Bosco Suuza explained to Nansubuga that the document she signed was not an agreement but powers of attorney. Buzibira asked Nansubuga why she went to Buzibira instead of Uganda Land Commission where government compensations are processed. Nansubuga explained that she used Buzibira as her lawyer because she didn't know how to go about the compensation process. According to Suuza, after signing off the powers of attorney, Buzibira made Nansubuga to sign an application form for compensation from the Land Fund on May 27, 2015. Nansubuga says she waited for the compensation in vain and repeatedly called Buzibira without success. According to Nansubuga, after a long wait Buzibira met her and asked her whether she would accept to sell the land to an individual. Nansubuga said she accepted the offer since she was in desperate need of money and sold Block 223, Plot 1 Buyaga and Block 224, Plot 1 Buyaga to a one, Warren Mwesigye at Shs 80 million and Shs 190 million respectively. She explained to the Commission that prior to the transaction, she had never met Mwesigye and only met him when Buzibira called her to his office. Nansubuga also explained that despite signing the sale agreement; she was not given any copies. Suuza asked Nansubuga whether Buzibira updated on the fate of her earlier application for compensation from government after the land was sold to Mwesigye. In her response, Nansubuga said she didn't receive any information from Buzibira about the government compensation. She also denied received any compensation from government for the land in question. Suuza explained that documents before the Commission show that before Nansubuga signed off the Powers of Attorney on October 27, 2015 authorizing Buzibira to pursue compensation from government, he received Shs 200 million from the Land Fund on July 24, 2015 in Nansubuga's name. He explained that Buzibira continued picked money in seven instalments from the Land Fund ranging between Shs 50 million and 200 million on different dates in 2015, 2016 and 2017. Suuza told Nansubuga that Buzibira has so far received Shs 650 million compensation for Block 223 Plot 1 Buyaga and Shs 821 million for Block 224, Plot 1 Buyaga. "For Block 223 Plot 1, Mr Buzibira on your behalf has been given Shs 650 million, if you subtract the Shs 80 million that Warren Mwesigye gave you, you have been conned of Shs 570 million so far. The land has been valued at Shs 650 million. For Block 224 Plot 1, the land was valued at Shs 821 million which has all been received by Buzibira on your behalf. If you subtract the Shs 190 million they paid, there’s a balance of Shs 631 million." said Suuza. When asked by Suusa whether she was surprised at what the "white collar thieves have done" to her, Nansubuga said that she was shocked and surprised by the revelations but had nothing to do. "Yes my lord am surprised and shocked but I have nothing to do." she said. Suuza also read out a November 23, 2016 letter authored by the Lands minister Betty Amongi addressed to the chairperson Uganda Land Commission authorising the urgent payment of compensation to 8 people including Nansubuga who was third on the list. Amongi's letter was reportedly based on a directive from the principal private secretary to the president, Molly Kamukama. Asked whether she ever approached the president or Kamukama for assistance, Nansubuga said she didn't. Suuza pinned Buzibira for conspiring and taking advantage of Nansubuga and conning her millions of shillings. "These thugs, these thieves they took advantage of you - a poor lady with limited education and exposure. They lied to you and they conned you out of all those millions that I have told you. Not only that, they used your name and went to the highest office in the land and claimed to be acting on your behalf. Somewhere along the way a minister [Betty Amongi] got involved. More money was paid in your name and you know nothing about it, which is tragic." he said. While appearing before the Land Commission last month, the Commission quizzed Buzibira over his involvement in the questionable land deal, failure to act professionally, conspiracy to defraud and other criminal acts. It came after lawyers under Frank Tumusiime and Company Advocates were implicated for fraudulently acquiring more than Shs 16 billion meant to compensate 20 claimants from the Land Fund under Uganda Land Commission (ULC). Buzibira then admitted that some of the clients instructed him through his law firm while others contacted him personally to handle all the processes on their behalf. "We began receiving instructions for the Land Fund in 2013 and I acted as an agent and advocate. The clients came on referral basing on the number of cases I had handled. The money was paid quarterly in installments and the vouchers show that Shs 13.3 billion has since been paid and balances in the range of Shs 5 billion is still pending," Buzibira told the Commission. The Land Fund was established under Section 41 of the Land Act. The fund is a multi-purpose resource envelope meant to serve targeted beneficiaries, including tenants seeking to buy or own land, government seeking to buy land for redistribution to bonafide occupants or resettlement of the landless among others. It is now obviously clear to all that the vast lands of Buyaga and Bugangayizi must stay within the ownership of the so called absent land owners of the International 1900 Buganda and British agreement. There is no good that can come out of grabbing our African ancestral lands by fraud. East Africa’s military expenditure dropped by more than 60 per cent in the past three years, reaching $32 million in 2017, from a high of $92 million in 2015. South Sudan, which has been the region’s biggest military spender, did not make any purchases last year, largely because of an ailing economy and threats of an arms embargo. The latest report by the Stockholm International Peace Research Institute (Sipri) shows that Uganda spent $18 million in 2017, against the previous year’s purchases that were below $1 million. Kenya slashed its spending by half to $13 million from $28 million a year earlier, while Tanzania did not make purchases last year, after spending $20 million in 2016. Uganda expects five helicopters from the United States later this year as part of a $87.6 million contract with Bell Helicopters signed in September 2016. Bell Helicopters is to supply Kenya and Uganda with 13 helicopters and spares, which these two countries plan to use to boost their operations in neighbouring Somalia, where they are fighting al-Shabaab militants under the African Union Mission in Somalia (Amisom) command. Uganda’s expenditure is curious as it fights allegations, alongside Kenya, of secretly arming Juba. “Weapons continue to flow into South Sudan from diverse sources, often with the co-ordination of neighbouring countries. It is true that large quantities of weapons and ammunition are flowing into South Sudan through Kenya and Uganda,” Adama Dieng, UN special adviser for prevention of genocide told Voice of America. 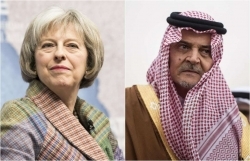 But, both governments have denied the allegations. “Kenya remains impartial in regard to the South Sudanese parties, including the political parties as well as the various armed and non-armed opposition groups, as it rallies the regional governments and the international community to sustain pressure on the parties to recommit to the peace process,” said Kenya’s Foreign Affairs Cabinet Secretary Monica Juma. On Thursday, the UN renewed the South Sudan peacekeeping mission mandate and threatened Juba with an arms embargo, barely a month after the US drafted a resolution pushing for an arms embargo against South Sudan to pile more pressure on President Salva Kiir. “I urge my fellow Council members to support an arms embargo. This isn’t punishment. Nor is it a meaningless gesture. It is something we can do to actually help the people of South Sudan — to slow the violence, slow the flow of arms and ammunition, and protect innocent lives,” US ambassador to the United Nations Nikki Haley told the UN Security Council. In 2016, a confidential UN report also accused Egypt of selling military equipment, small arms, ammunition and armoured vehicles to Juba, a claim that the UN panel of experts say was corroborated by high-ranking South Sudanese military and intelligence officers. That same year, Juba acquired two fighter jets and truckloads of small arms ammunition. “Two truckloads of ammunition were transferred to the capital Juba from Uganda in June 2016. Later that year, South Sudanese ex-army chief Paul Malong asked a Lebanese company to begin developing a small arms ammunition manufacturing facility in Juba,” the UN monitors said in their report, adding that they were investigating how the two L39 jets from Ukraine that were sold to Uganda ended up with the South Sudanese army. 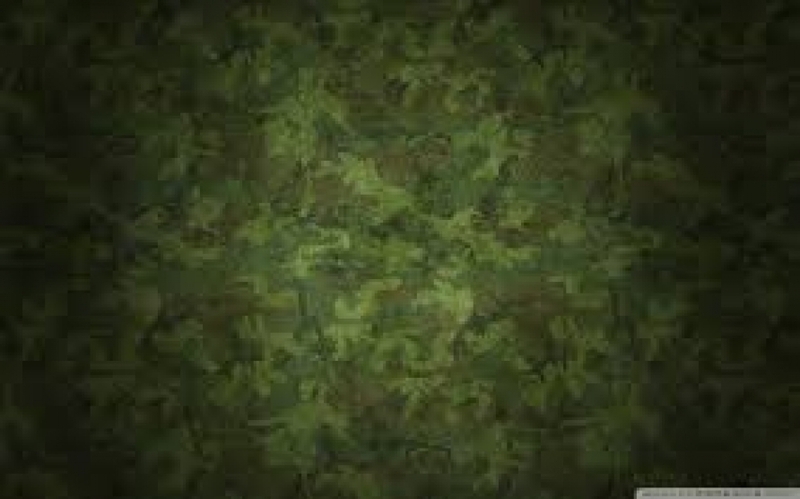 Last year, confidential reports suggested that Kampala had purchased weapons from Russia, landing in early August at the Entebbe airport en route to Juba, a claim the Uganda Peoples Defence Forces (UPDF) denied. The 40-tonne consignment consisted of 31 tonnes of AK-47 rifles, bayonets, extra magazines and assorted weapons. Head of the Sipri project on military expenditure in the arms transfers and military expenditure programme Sam Perlo-Freeman said that some of these purchases in the region had a direct relation to the conflict in Somalia, where Burundi, Uganda and Kenya are participating in the African Union mission against al-Shabaab. Uganda has in the past two years lost military hardware in the Somalia conflict and is believed to have used part of the $18 million for armament. According to UPDF records, since the 2011 incursion into Somalia, Uganda has lost two MI-24 helicopters worth around $10 million, tanks, armoured personnel carriers, earth moving equipment and ammunition. In September 2017, Uganda’s contingent in Amisom got 19 Acmat Bastion armoured vehicles from the United States and in February this year, the same contingent received an unspecified number of unmanned aerial vehicles to be used for intelligence, surveillance and reconnaissance. The Sipri report shows that last year, Kenya bought a second-hand naval gun, AK-630 30mm, from Montenegro for the modernisation of Jasiri OPV (offshore patrol vessel). In February 2017, the Kenya Navy received the last six metal shark patrol boats. Another four were handed over last year bringing their total cost to $4.9 million. Last year, Kenya also received an unknown number of AH-1 cobra attack helicopters as part of its military partnership with Jordan. In July 2017, the country also received its last two Huey II helicopters. The aircraft is powered by a new Honeywell T53-L-703 engine, enabling it to have an improved hover performance in hot conditions, mirroring KDF’s needs in Somalia. Kenya’s military expenditure in 2018 is expected to rise as it is awaiting a dozen MD 530F armed light helicopters from US-based MD Helicopters at a cost of $253 million, whose orders were placed in May 2017. The order from Nairobi included the provision of MD 530F “cayuse warrior” light attack helicopters, 24 HMP 400 machine gun pod systems, 24 M260 rocket launcher systems and assorted ammunition. In the past three years, Tanzania has acquired 14 new J-7Gs fighter jets, Type 63A amphibious tanks, A100 multiple rocket launchers and Type 07PA self-propelled mortars from China. The Sipri report shows that arms imports by African states decreased by 22 per cent in the past five years. Russian arms exports to Africa fell by 32 per cent although the country still accounted for 39 per cent of total imports to the continent. On the other hand, China’s arms exports to Africa rose by 55 per cent, and its share of total African arms imports increased from 8.4 per cent to 17 per cent. In the past three years, 22 sub-Saharan African countries procured major arms from China which saw Beijing accounting for 27 per cent of sub-Saharan African arms imports. The US accounted for 11 per cent of arms exports to Africa over the same period with its transfers mainly in small batches of weapons and included eight helicopters for Kenya and five for Uganda, which were supplied as US military aid. Religious leader under IRCU recently met Mr Museveni. He pledged support for IRCU’s planned national dialogue. With this state of affairs, most Ugandans would espouse the idea of a national dialogue as a basis or platform from which a national consensus would be generated to rally the population. Uganda has been an independent country since Tuesday, October 9, 1962. However, 56 years after independence, all the political efforts aimed at nation building have not yielded tangible and sustainable value systems to build a national political culture and consensus. The political history of Uganda reads like a case study in a crisis of confidence; with brutal armed conflict as a sub text. And with such a crisis of confidence, building a national consensus to rally the population has eluded the country. The view that electoral processes would bring the much needed national consensus has fallen flat. For good measure, Uganda has now held five consecutive national elections since 1996. If one added the election that brought the first post-independence government in 1962 and the famous 1980 elections, Uganda is likely to be one of the very few African countries that have held more than five multi-party elections. Yet all of those numbers of elections add up to nothing; because they have always attracted the tag of ‘disputed elections’. Most Ugandans now seem to have come to the conclusion that elections alone are unlikely to produce the much-needed and elusive national consensus. That’s why Ugandans now have minimal confidence in electoral processes as a source of a national consensus behind which to rally the population and national vision. After the 2011 and 2016 elections, it became apparent to most Ugandans that elections would not be the main instrument to build a national consensus. And the idea of seeking alternative tools was born. The idea of holding a national dialogue was mooted by The Elders Forum of Uganda (TEFU) immediately after the 2016 elections. It has gained so much currency that it now represents one of (or the only?) hope for Uganda to generate a national consensus. For some historical background, it should be noted that Uganda has had three clear opportunities to build national consensus namely: 1) The political and administrative processes that led Uganda to independence; 2) The 1978-9 war effort against military ruler Gen Idi Amin; and 3) The process of making the 1995 Constitution. However, all these opportunities seem to have only offered the political and military elite an opportunity to pursue their own political interests than to forge a national political value system on which a national consensus would be built. Whereas the lead-up to the 1962 consensus was about who would own which part of Uganda after the departure of the British colonialists, the 1995 Constitution was more concerned with the holding and exercising of state power. Clearly both the 1962 (pre-independence) consensus and the 1995 consensus fell short of addressing some historical, current and future challenges. And momentous opportunities of 1962 and 1995 were clouded by immediacy and currency of the time. The currency in 1962 was the urge or the drive to (quickly) gain independence from the British colonialists and in 1995, it was about the legitimacy of the political and military elite who had grabbed power by force of arms in 1986. Today, the call for a national dialogue represents another attempt by Ugandans to forge a national consensus. This time Ugandans seek sustainable solutions to their historical, current and future challenges. MPs have warned ministry of Finance permanent secretary Keith Muhakanizi to back off parliament and wait for auditor general's report on the controversial $200m (Shs 715 billion) Preferential Trade Area (PTA) loan. The MPs accuse ministry of Finance of obtaining the loan by 'by false pretense', but in an interview with Daily Monitor, Muhakanizi branded the MPs as ignorant and biased with a conspiracy. Parliament's Public Accounts Committee (PAC) last year investigated the utilisation and disbursement of the PTA loan, in which Finance is accused of failing to disburse the money to the intended beneficiaries even after the PTA bank released the money. The loan proposal had originally been rejected by parliament on January 7, 2016, but ministry of Finance reportedly changed the objective of the loan, emphasizing medical supplies to get the required parliamentary approval on April 26, 2016. Despite the loan approval and acquisition, National Medical Stores (NMS) to date is yet to get the Shs 156 billion from the loan to purchase drugs. The loan was among other issues to ease finance expenditure pressure, resulting from the exchange rate depreciation in financial year 2015/2016. In its report to the House recently, PAC recommended that Muhakanizi be relieved of his duties and Finance minister Matia Kasaija be censored following their involvement in processing the said loan. However speaker Rebecca Kadaga resolved that the auditor general first audits the PTA loan before debate takes place in the House. At a press conference addressed by PAC members led by Angeline Ossegge at parliament, legislators warned Muhakanizi against what they believe is contempt of the House. “We are surprised at the ignorance, behaviour and largely arrogance that even before we see what’s in auditor general’s report, we see them abusing parliament,” PAC vice chairperson Gerald Karuhanga said. “It’s sad but Mr Muhakanizi must realize that no amount of abuse or disregard of parliament is going to deter us [MPs] from interrogating the ministry of Finance just like all other agencies of government that report to PAC,” he added. The MPs argue that if Kasaija and Muhakanizi had listened to Bank of Uganda governor Emmanuel Mutebile’s advice not to go for an interest loan, Uganda would be saved of interest to a tune of Shs 81 billion. Uganda will be required to pay an extra Shs 81 billion because of the responsible officers’ (Kasaija and Muhakaniza) insistence on borrowing non-interest free money. The auditor general is expected to investigate the issue and deliver a report to the house this month before parliament can decide on the fate of Muhakanizi and that of minister Kasaija. The inspector general of police (IGP), General Kale Kayihura, believes the public has been unfair in its criticism of police’s work. He believes Uganda has the best police force ever under his command. But this belief does not tally with the rot exposed recently by the intervention of the Chieftaincy of Military Intelligence (CMI) agents. Most of his trusted officers who were arrested were involved in acts ranging from blackmail to kidnap to corruption to murder. General Kayihura is like the legendary irritated dog that was heavily infested with fleas; instead of seeking the help of the master, it chose to involve itself in the game of chasing its own tail. The more it attempted to catch the tail, the more confusion it caused for itself. Kayihura is one of the longest-serving IGPs, having assumed that office in 2005. Therefore, the shape and character of the current police force is directly his work. While presiding over the passing out of 58 police officers at the Police Command and Staff College at Bwebajja, Kayihura declared that he had ordered for the overhaul of 4,000 criminal investigations officers. He wants to rid the directorate of criminal investigations of bad apples. The clean-up, according to Kayihura, is to be followed up by further training by former USA Federal Bureau of Investigation (FBI) agents and British police officers (Scotland Yard). Perhaps before the good general embarks on training, he needs to establish one thing in the forces: legitimacy. There is no amount of training that will turn police into a reliable and legitimate force if people do not trust it. Our police force is so militarized that at times it appears like an occupation army. The officers are armed to the teeth and sometimes the power of being armed takes away the people skills that police officers need to solve social issues. The police have driven a wedge between themselves and the people. Some are like vultures, turning cases to be investigated into carcasses to be devoured. Certain cases can never attract the attention and expertise of a police officer because it is regarded as ‘dry’. Kayihura’s reign at police has more faith in firepower than establishing legitimate relations with the community. But the firepower has failed to rid the city of criminals who attack residents everywhere and steal their property. At times they have killed those who try to resist them. The firepower has failed to solve various mysterious murder cases of women in Entebbe and other areas. It is under his reign that all manner of paramilitary outfits are taking over the work of police. We have had the Boda Boda 2010 who are not recognized by the law but they were armed. They had power to arrest, maim and kill in the name of police. Some police officers could not even touch the Boda Boda 2010 agents. Then we had the crime preventers. This outfit was misconceived and ended up producing more crime harbingers than preventers. The Constitution and other laws such as the Police Act empower all citizens to be crime preventers. Police didn’t have to create another force to augment its work. What would have worked better is to improve their social relations with various communities and perhaps recruit more police officers than engage in this failed project. Community leaders are more suited to prevent crime than the armed preventers. These leaders know who is or not employed, they know school dropouts in the area, they know those involved in drug abuse, or the strangers in the community. They should have borrowed the idea of ten cells (Mayumba Kkumi) and improved on it. In the past, it did a wonderful job of gathering intelligence and dismantling crime cells. What the general needs to do is to reestablish legitimacy of police with citizens. Ugandan women need to feel that when they are in the hands of police officers, their breasts do not risk being fondled. The men, too, should feel that they won’t be thrown under the seats of pickup trucks like sacks of charcoal! Crime preventers should be dismantled and more resources invested in police officers. The welfare of police needs improvement. Otherwise, Kayihura will keep chasing his tail with no result. The author is the business development director at The Observer Media Limited. These politicians represent a small part of the rebels that have made the country of Uganda. It was decided this week that the ruling NRM party will write to its Members of Parliament who voted against the removal of age limit for presidential candidates to explain their decision. It emerged during the Tuesday NRM Parliamentary Caucus that the 27 MPs who sided with the Opposition to reject the amendment of the Constitution would know whether they will appear before the party disciplinary committee or not. But this is not the first time we see seemingly independent-minded politicians go against their party positions in Ugandan politics. In this article we trace the political mavericks since 1962. Earlier in 1962, Alex Yaffesi Lobidra, a UPC Member of Parliament representing West Nile and Madi North West Constituency, became the first Ugandan political maverick when he crossed the floor and became an Independent. This, he did after opposing his party position on expelling Kenyan trade unionists from Uganda. Majority of UPC members, as a ruling party, had resolved to expel the Kenyans. But on November 6, 1962, Lobidra announced that he had crossed the floor of the House, citing what he called “disillusionment” with the UPC party. “I have become an Independent member of the House. I would never join the DP,” he declared. While his stand did not stop the UPC government from expelling Kenyans from Uganda, history absolved him. In his deliberation Lobidra said the Uganda government wanted to expel Kenyan traders for fear of competition and in future someone will use the same excuse to expel Asians (Indians) from Uganda. And in November 1972, president Idi Amin expelled Indians from Uganda. Lobidra remained a pain in UPC’s neck as an Independent MP until 1966 when president Obote lured him back to the party and appointed him permanent secretary Ministry of Housing and Labour. Bidandi Ssali may be aging and out of politics, but those who encountered him in Kampala in the early and mid-1960s say he was a power to reckon with. As a UPC Youth Wing leader, he loved his party and wanted it to thrive on democratic principles. But that was not to be and a clash was inevitable. Bidandi became more prominent in politics after the April 1964 UPC delegates’ conference held in Gulu for the election of party leadership. Grace Ibingira was elected new party secretary general, having controversially defeated former party secretary general John Kakonge with 127 votes. Ibingira got 738 votes against Kakonge’s 611 votes. 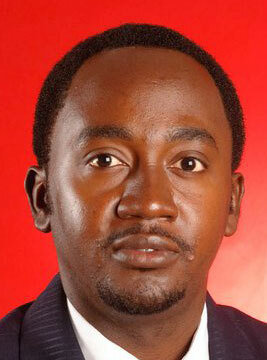 Bidandi and other UPC youth wingers, including Kintu Musoke and Kirunda Kivejinja, opposed the sham election. After the Gulu conference, Ibingira restructured the party organisation and gave powers to what others saw as dishing out to his cronies such as Kezekia Musisi, a Kampala City councillor. This angered many in the party, and on the morning of September 12, 1964, Bidandi Ssali led a UPC Youth Wingers demonstration and stormed Kampala Club where UPC stalwarts were dining. The situation was saved by the arrival of police. Bidandi’s action and concern attracted the attention of party leader and then prime minister Milton Obote. In December 1964, Bidandi Ssali met Obote and told him that while he loved the party, he was opposed to the treachery and intrigue in UPC. He also warned the prime minister that Ibingira was using his position as secretary general to create a Bantu faction aimed at the ousting the Nilotics from power, a claim Ibingira would deny. But using his power, Ibingira caused the expulsion of Bidandi Ssali and others from the party. Two years later, history exonerated Bidandi Ssali. In February 1966, Obote arrested Ibingira and four other ministers, accusing them of planning a coup against him. During the making of the 1967 Republic Constitution, about 20 UPC MPs objected their party position and so were absent on the day the Constitution was promulgated. Among those who opposed their party wrong policies was Teso East MP Curthbert Obwangor who was later imprisoned on alleged attempted treason charges. Today as a politician, Aggrey Awori maybe operating from behind the scenes, but between 1981 and 1982, he was a UPC party maverick. He openly opposed and intellectually debated against the views of the party, party president as well as party Secretary General Luwuliza Kirunda. In order to manage him, in 1982 president Obote appointed him Uganda’s ambassador Extraordinary and Plenipotentiary to Washington. This was done to put him out of the national politics. Incensed by Awori’s public outbursts, Obote one day invited Awori to his office on the fourth floor of the Parliament building in Kampala. In a heated argument, Obote reminded Awori that it was him, and not Awori, who was running the country. When Awori asked why, Obote answered: “You understand Americans better and the World Bank and IMF.” His new posting was to take immediate effect. When the 1995 Constitution came into force, the idea that President Museveni should run again in 1996 became divisive. A number of his Bush War colleagues thought that having served as post-war leader for 10 years, the former guerrilla had done his time and needed to retire. In any case, Mr Museveni had promised to serve only four years as president. After Mr Museveni was returned as winner of the presidential election for the first time in 1996, a number of his Bush War colleagues who felt the ideals for which they had fought had begun to be neglected felt that should be his last term. Discussions started on how Mr Museveni would be replaced, with key players including Eriya Kategaya, who was deemed to be Museveni’s No. 2, Moses Kigongo and Salim Saleh also taking part in the conversations. Another former Bush War fighter who took interest in the debate on transiting from Museveni was Kizza Besigye, then a colonel holding a command position in the army. But as the 2001 election drew closer, it became increasingly likely that Mr Museveni would run again, causing a split among the Bush War comrades that were debating his exit. The majority took the view that if Museveni wanted, they would let him go for the second and “last” constitutional term that would run between 2001 and 2006. Besigye would have none of this. Besigye in 2009 authored a stinging critique of Museveni’s government entitled “An insider’s account of how the Movement lost the broad base”, setting off panic within the establishment. The dossier laid Mr Museveni’s government bare, with his former Bush War physician accusing his government of corruption, nepotism and cronyism. The talk then was that whereas what Besigye had written bore truth and needed to be discussed, he had expressed the views in “the wrong forum”. Being a serving soldier, Mr Museveni said Besigye would be tried in the military court. After months of back and forth, Besigye was spared the military trial and allowed to retire from the army, releasing him to launch a political assault on Museveni that, 18 years and four presidential elections in which both men have faced off, is still raging. In early 2005, the ruling National Resistance Movement (NRM) party held a conference at Kyankwanzi to map out a strategy to remove the presidential term limits. The move was opposed by many of the NRM members, but some backed down after they were told to toe the party line. Dr Miria Matembe, Sarah Kiyingi, Jaberi Bidandi Ssali and Eriya Kategaya were party stalwarts who unshakably opposed the party move. And because of opposing the party line, in the subsequent Cabinet reshuffle, all the four were dropped. Mavericks in the party tend to create cracks in the party. This happened to the NRM when its members – Ndorwa East MP Wilfred Niwagaba, Buyaga West MP Barnabas Tinkasiimire, Lwemiyaga MP Theodore Ssekikubo and Kampala Central MP Mohamed Nsereko – came out strongly during the oil debate. The group was later expelled by the top organ of the ruling NRM after they were implicated over indiscipline and breach of the party code of conduct. An attempt to have them kicked out of Parliament, however, hit a snag. For the first time, a special place was created for the four in Parliament pending a court case which also ended in their favour. The four commonly referred to as “NRM Rebel MPs” enjoy huge support in their constituencies. In December 2017, several NRM Members of Parliament joined the Opposition in objecting to the removal of Article 102b of the Constitution which had put a 75-year cap for those intending to run for president. Since then, the NRM has been talking of disciplining those who went against the party position of supporting its removal. AMAGYE GA UGANDA OBA AGA UPDF SIGA MUNTU OMU BWATI. ENSONGA EYO TEBA YA BWENKANYA YE OMUWI WOMUSOLO ATE NASASULA EMPEERA ENNENE ENYO EYA MAGYE GANO. KISUBIRWA NTI AMAGYE GA UGANDA GALIWO KULWO BULUNGI BWA BANTU BONNA ABENSI YA UGANDA. AMAGYE MU AFRICA TEGALINA KUSIRIKA BUSIRISI KUSONGA ZOBUFUZI EZIKWATA KUNSI YA AFRICA YONNA. TEGAKYADDUKANYIZIBWA NGA KUMUSINGI OGWALIWO NGA AFRICA EKYAFUGIBWA OBUMBULA MUMATWAALE AGA BUNGEREZA, BUFRANSA, PORTUGAL NE SPAIN. OBUKUGU MU MAGYE GAFRICA BULABIKE.